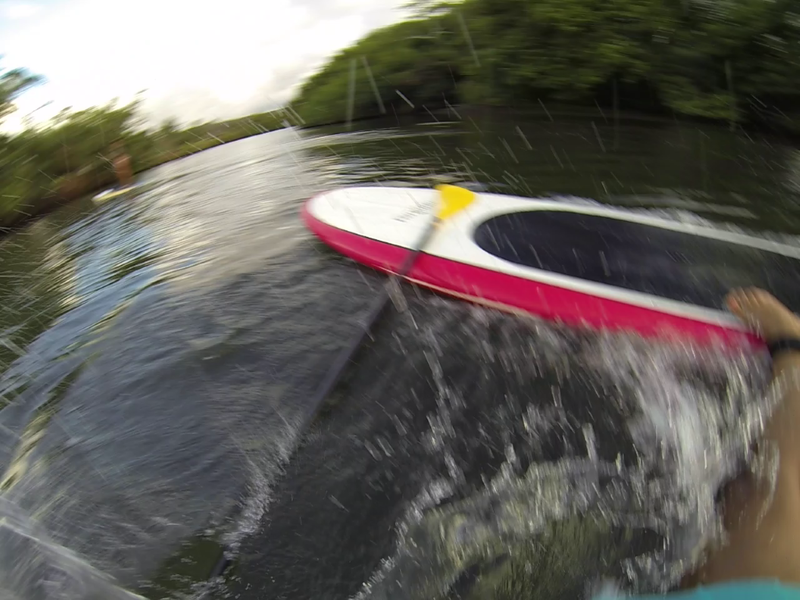 My new favorite water sport is now stand up paddling, otherwise known as SUP! I’m ready to go out and buy my very own stand up board! I’ll be sure to also buy a wetsuit which I will need to wear during the colder months in Canada. 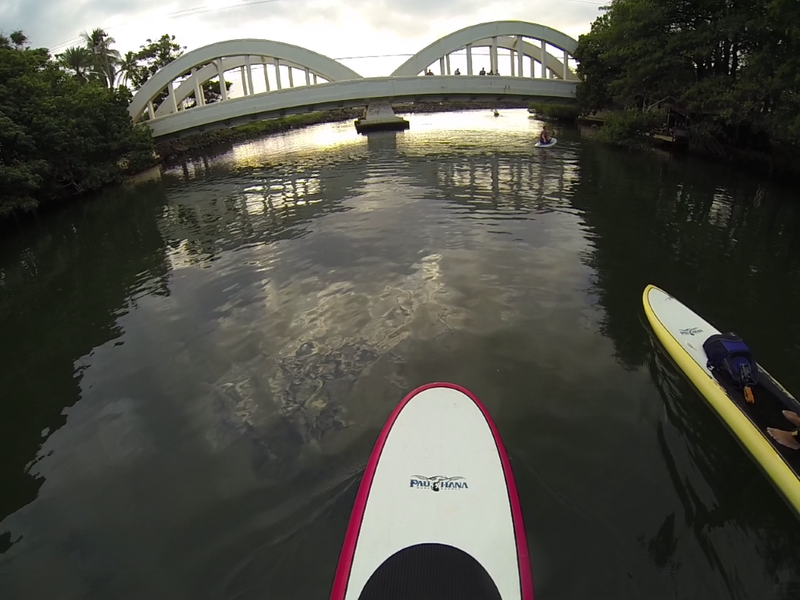 I tried SUP for the first time in Haleiwa, Hawaii on the North Shore of Oahu with Rainbow Watersports Adventures during their sunset paddle. 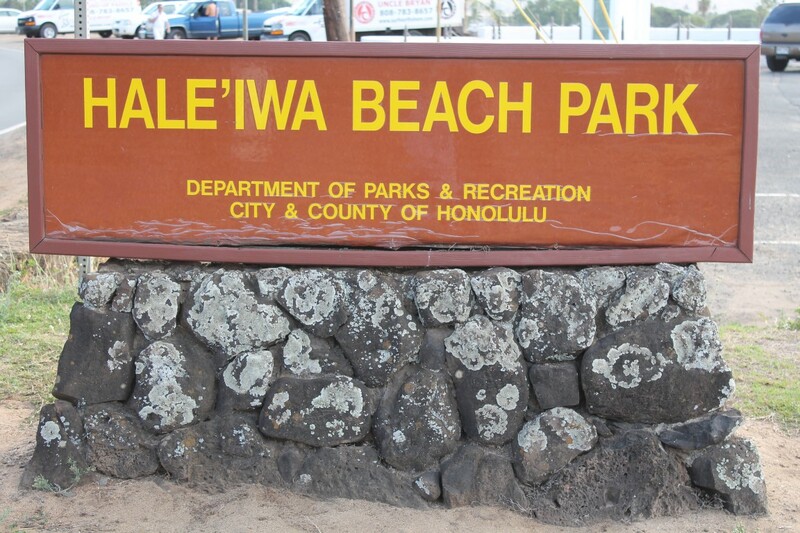 With my lesson beginning at Haleiwa Beach Park two hours before sunset, the sea turtles were active all around me as I made my way to one of Oahu’s most beautiful rivers. I could relax throughout my the two hour lesson because it took place on a protected bay and calm stream; I didn’t have to worry about the waves crashing down on me during this experience. 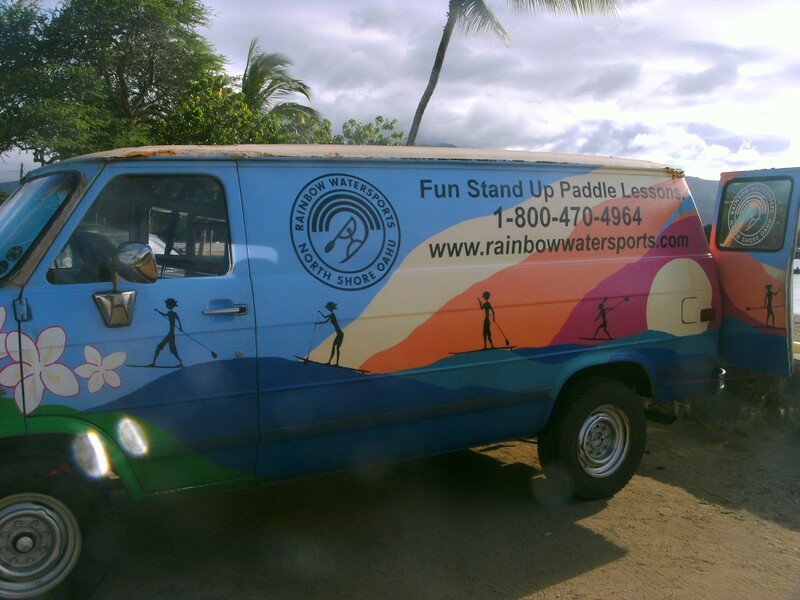 Rainbow Watersports Adventures began in 2008 and is known as the original stand up paddle school on Oahu’s North Shore because the founders, Nate and Heidi Burgoyne, have been long time investors in the sport. Nate authored the first ever published book on stand up paddling: The Stand Up Paddle Book, and is the founder and editor of Stand Up Paddle Surfing Magazine. Heidi is one of the instructors at Rainbow Watersports and has regularly placed in the top 3 in local paddle races. With all of Heidi’s previous experience teaching various water sports she continues to be one of the most positive and passionate instructors out there. 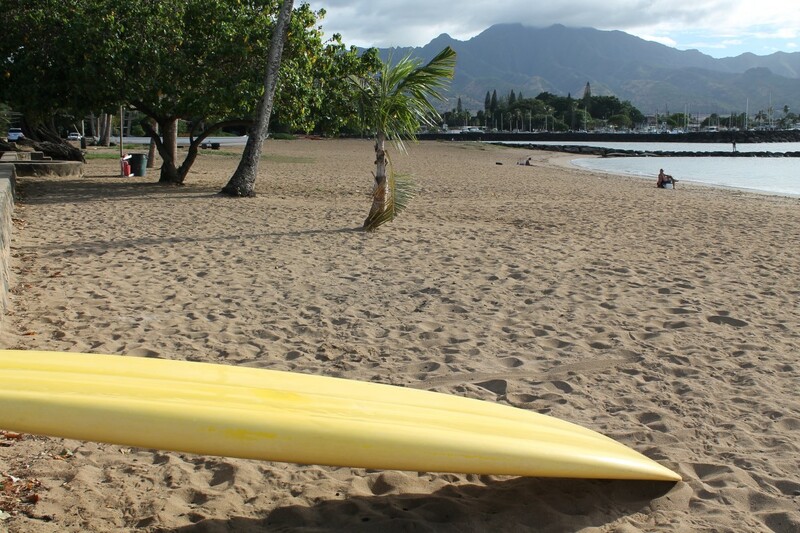 Both Nate and Heidi have taught people from all over the world how to stand up paddle. Their enthusiasm for the sport is contagious, that’s probably part of the reason why I was hooked on SUIP from the moment I stood up on the board. 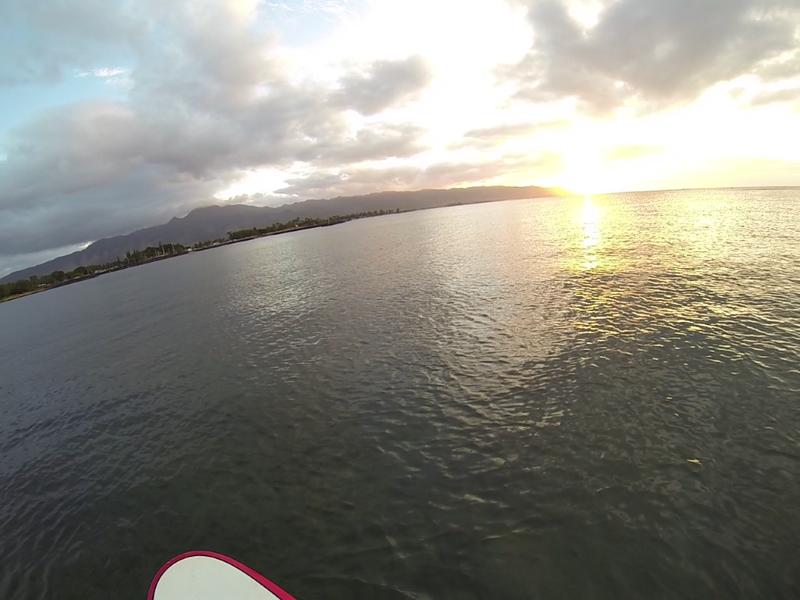 I took my SUP lesson from Jodi who is originally from Maui and she is absolutely incredible! Her love for Hawaii is overflowing from her. Throughout my private lesson we had great conversations, good laughs, and moments when we were both left speechless by the beauty around us. I couldn’t have asked for a better instructor for my first lesson. I knew my life was in good hands when I learned that Jodi is a Certified Personal Trainer, Health & Fitness instructor, and Certified Lifeguard. Her other accomplishments include being a competitive scholar athlete in multiple sports, fitness modeling, appearing on multiple TV shows (including The Oprah Show and Wheel of Fortune), being certified with the Aerobics & Fitness Association of America, and founding her own personal training solutions company. All of the instructors at Rainbow Watersports Adventures are extremely talented. 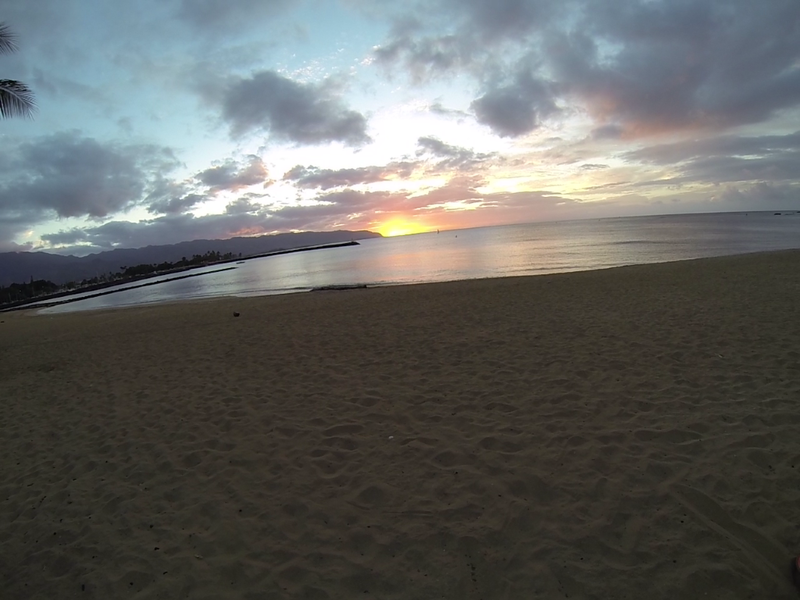 GoPro on and ready to catch the sunset! During my first lesson I learned the basics of SUP: getting on and off the board, standing on the board, paddling (and the various types of paddling), turning, and transporting the board. I paddled 2 miles throughout the first lesson and I could have continued for hours. 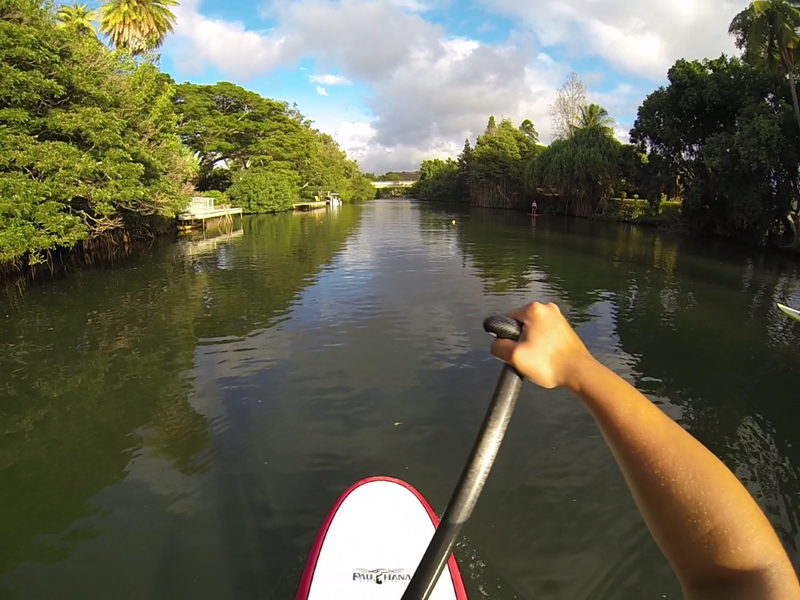 SUP is an excellent full body workout, yet you can go at your own pace and make it what you want. Included in my lesson were free pictures! Throughout the lesson Jodi took pictures of me paddling (yes, she caught me on camera after I fell off)! Very few companies include free pictures for their guests. 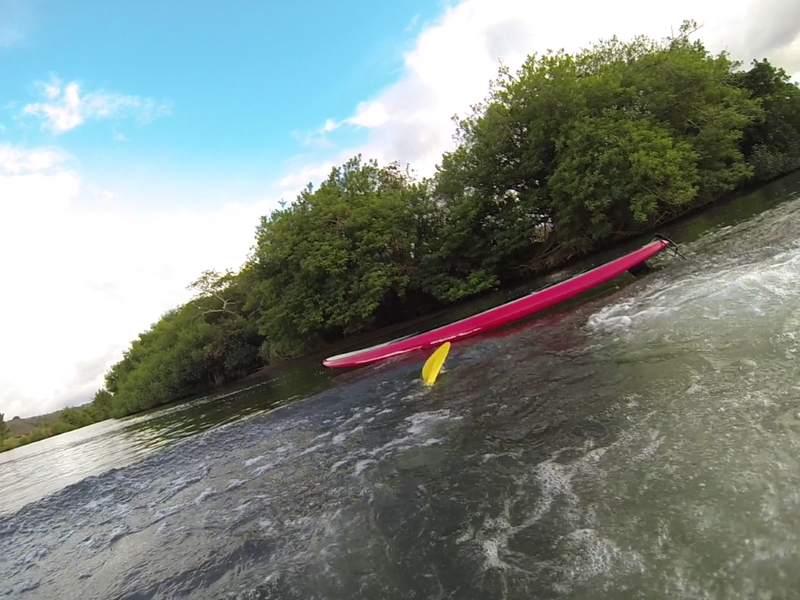 I couldn’t have asked for a more positive experience trying SUP for the first time. There is nothing better than skimming across the calm waters in Hawaii while the sun goes down with the turtles popping their sweet little heads out of the water. It’s moments like that which remind me how lucky I am to have this opportunity to travel. 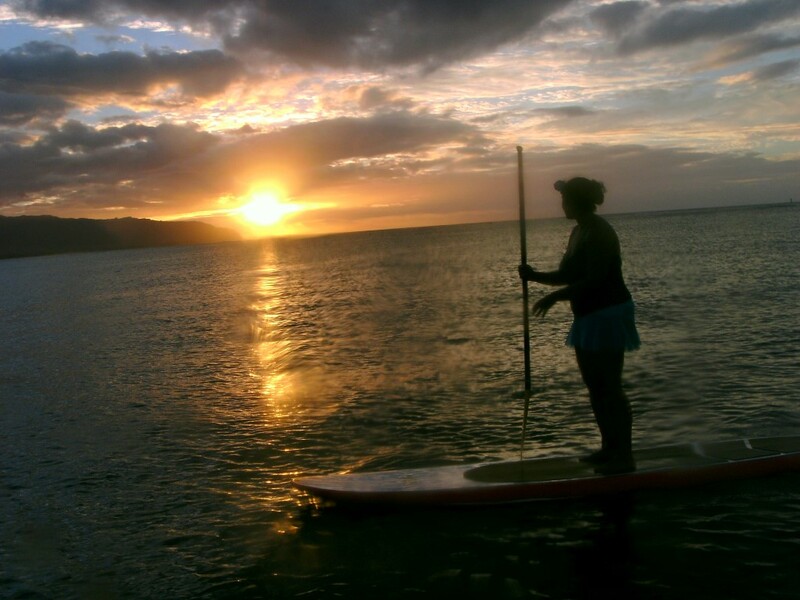 During all of my time in Hawaii my favorite sunset is still the one I saw from my stand up paddle board. Nothing comes even close to topping that evening. I can’t wait to get out and paddle board again. I could do it every day if I had the opportunity. This is when I fell off my board, luckily I only fell off once! Sometimes you fall, but you have to pick yourself up and try try again. I told Jodi that I meant for that happen…I did want to get into the water to have a little swim myself! Who I am kidding? I fell off! Celebrate Rainbow Watersports Adventures 5th birthday by paddling with them before October 31st; private lessons are $55 OFF the original price for two or more people! 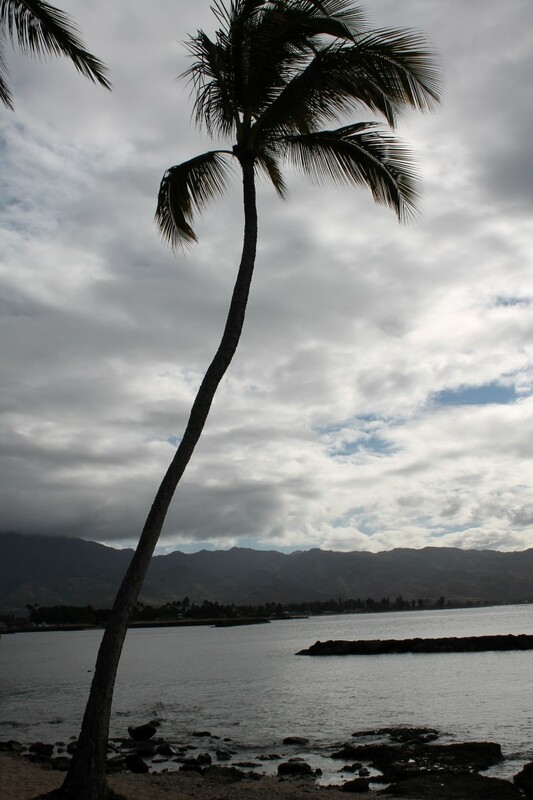 This entry was posted in Bucket List, Hawaii, Lifestyle, Reviews, travel, Turquoise Travel, USA and tagged adventure, bucketlist, experiences, Hawaii, Paddle Boarding, Rainbow Watersports Adventures, Travel, Try, Turquoise Compass, USA by Turquoise Compass. Bookmark the permalink. Yeah it is such an amazing sport. People are also using the stand up paddle board (and paddle) to surf! I live on the coast and it’s really becoming popular here. I wouldn’t fall off once tho. You really should try SUP. I think you would fall in love with the sport! It is not difficult to catch on and its for anyone at any level! If you are more advanced you can even surf big waves with the board and paddle! Get out! That’s what’s SUP! I really want to try paddle boarding. I’ll have to wait until I visit somewhere with calmer waters, though, I don’t think it’s very suitable for the waters of the UK! I loved the sport from the moment I got up on my board. I was a bit wobbly at first, but it didn’t take me long to catch on. 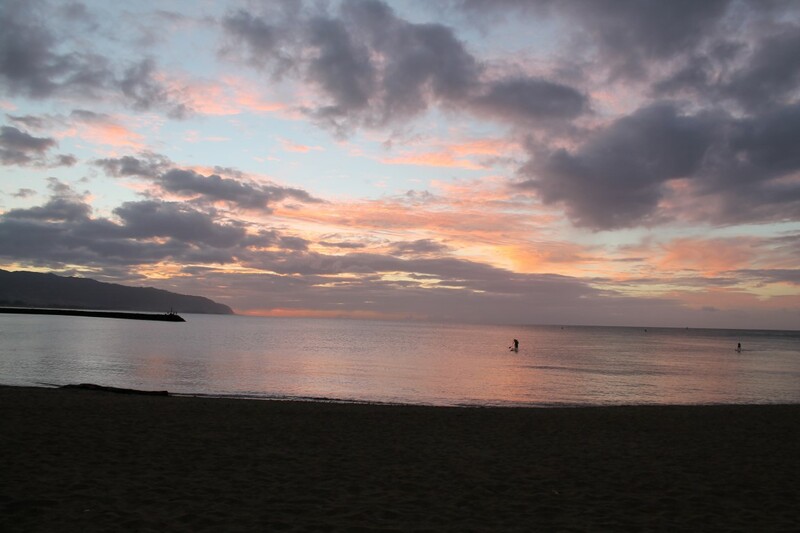 I would definitely try SUP on calm waters, but more advanced paddlers surf big waves with their board and paddle! Fun times…this is also on my bucket list. Wanted to try it in Myrtle beach last time but hubby didn’t so we jet skied instead. It was amazing! I can’t wait until I read about you trying it! Myrtle beach would be a great place to try it (you can always go back)! It’s your turn to pick the adventure now! SUP it is! I love its short form as well. Yeah, definitely wouldn’t be bringing my SLR camera near the water! Phew is right. I bought a GoPro when I started my year off so I could better document my experiences. I love trying new things, especially anything active. I’m just happy to find another sport to love. I love being active, but I am the type to get bored quickly and want to move on to something else. There is something completely addictive about SUP. I think it’s the fact that you always have fun on the board without needing to go anywhere; by just spinning in circles, or walking around your board, learning to balance. Well done for giving it go, the more times you fall in the better you’ll get! Thanks so much for your kind words. You are right, there is something addictive about SUP. I’m glad I tried it. I want to do it again soon.